ATLANTA – May 04, 2016 – GE (NYSE: GE) announced a five-year agreement to provide its MDS™ Orbit technology to Southern Company subsidiary, SouthernLINC Wireless. The integrated MDS Orbit platform and router solution helps provide more secure and reliable, high-speed, industrial-grade wireless communications essential to today's intelligent electricity networks. Central to the design, and to its flexibility, is the latest generation in Long Term Evolution (LTE)1 technology. Once installed, Orbit will enable Southern Company's four electric utilities to manage services more effectively for over four million customers across the Southeast. MDS Orbit will support Southern Company's need for adaptability, superior encryption, speed and range, while reducing network complexity. Its advanced networking capabilities enable each utility to remain highly flexible, helping optimize performance. At the same time, it complies with NERC-CIP2 and other cyber security regulatory guidelines. Multiple interfaces will simultaneously connect both transmission and distribution assets, along with maintenance vehicles and personnel for Southern Company utilities – Alabama Power, Georgia Power, Mississippi Power and Gulf Power. SouthernLINC Wireless will deploy the MDS Orbit platform and routers in conjunction with MDS PulseNET, GE's network management software. In addition to device and network management, PulseNET will give SouthernLINC the ability to auto-provision Orbit routers, with no human intervention, on its LTE network. "We chose GE's Orbit platform because it met the LTE project and operational requirements for our operating company's mission critical wireless communications needs. We are pleased with the Orbit platform's adaptability and with GE's commitment to meet our ever-changing security and performance needs," said Tom Newdome, SouthernLINC Wireless Engineering Director. "We are excited to be working with GE to improve wireless communication capabilities at Southern Company." "GE is thrilled to work with SouthernLINC on this industry-leading network upgrade project," said Luke Clemente, General Manager of Industrial Communications, a division of GE's Grid Solutions. "Our long history of quality, combined with our technical expertise enables us to truly partner with SouthernLINC; delivering a tailored hardware, firmware and software solution for consistent, reliable and secure network across the Southern Company subsidiaries. 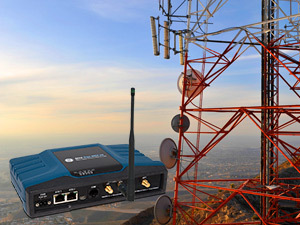 MDS Orbit technology offers a highly flexible multi-radio wireless communications platform which, when combined with GE's Predix Machine, serves as an ideal platform for the Industrial Internet and facilitates future innovations with SouthernLINC." Find out more information on this product as well as GE's Grid, Telecommunications and Battery Charging Solutions at UTC Telecom from May 3-6. 2 North American Electric Reliability Corporation - Critical Infrastructure Protection is a set of standards and requirements for protecting critical assets used in the bulk electric system and the systems that support those assets.